Spare a thought for the poor, unappreciated warbler in fall — stressed by migrating for miles through unfamiliar surroundings, it can’t relax into its regular routine, it can’t find its usual diet, it has to avoid strange predators, and to top it off, its dull winter plumage looks like every other warbler’s! Birders everywhere, unable to face impossible identifications, avert their eyes from these plain little birds, and just tick “warbler species” on their checklists. Warblers are hard to learn anyway. Names were assigned to the species without any thought of accurate representation. Canada Warblers are not found just in Canada, Olive Warblers are gray, and Magnolia Warblers visit other trees. I am pretty much spoiled by the fact that our most common warbler here is one that does live up to its name, Pine Warbler. 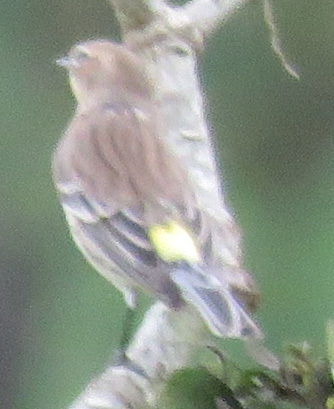 It’s yellow, it hangs out with Eastern Bluebirds, it lives in pine trees. Most of the year, when I see a warbler, I know what it is, and I don’t think further. This time of year, we do have other warblers pass through. Some of them are the aptly-named Yellow-rumped Warblers. They would be easy to identify if they would just come out of the branches for a minute and turn around so I can see their yellow rumps! And then stay still long enough for me to focus! 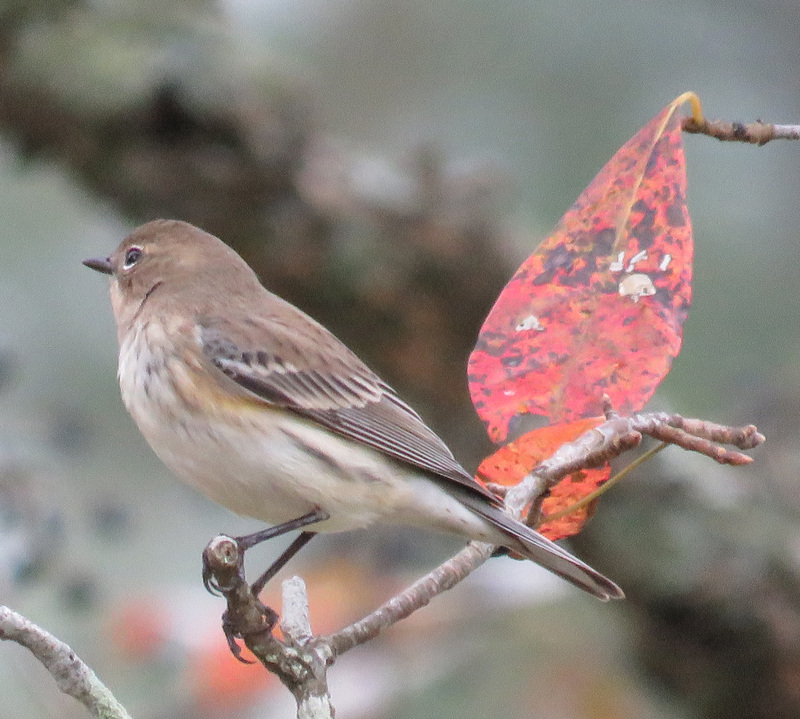 Yellow-rumped Warbler: the evidence. Blurry pic, but at least I have proof of the bird’s identity. — and after comparing its picture to the ones in my 67 bird books (three of them just on warblers), I still don’t know what it is! 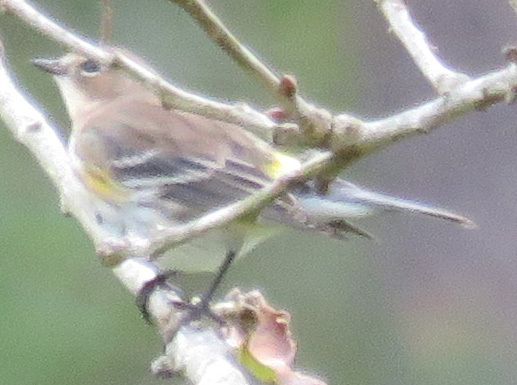 I think it is a young Yellow-rumped Warbler, but I can’t tell for sure. According to Cornell Lab of Ornithology, there are only five warblers that should be here, but to me it’s not a perfect match for any of them. It got me thinking, what if there was a media campaign to get these fall warblers more attention? What would someone have to do to motivate me to really learn these plain little birds? What or who could change their image from unnoticed commuter-types passing through, into famous celebrities on a world tour? And the answer that popped into my head was, Andy Warhol. The man who took a soup can and made it art could surely do something for warblers. Well, that lead to a morning of fun. 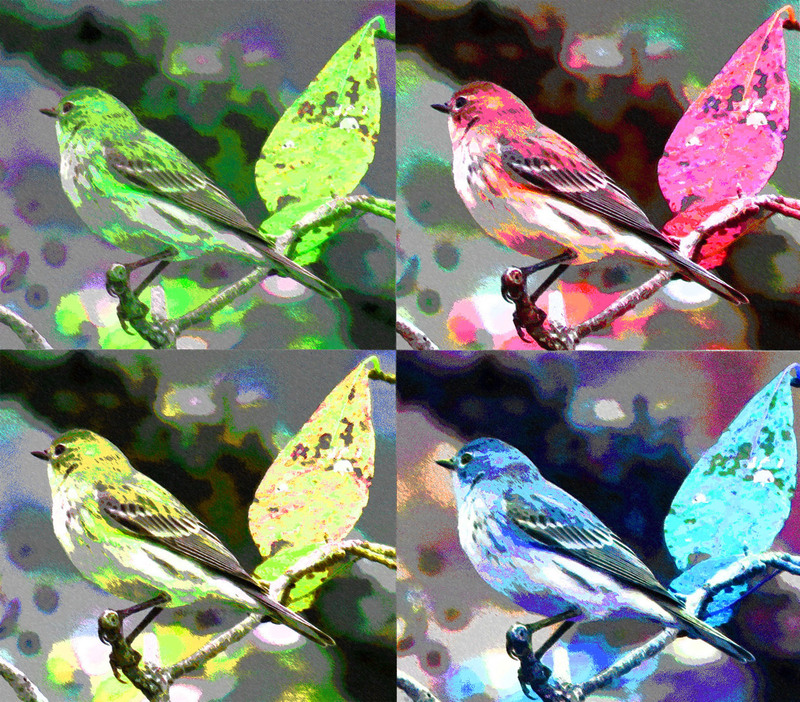 I put the bird into every color and filter I could find. 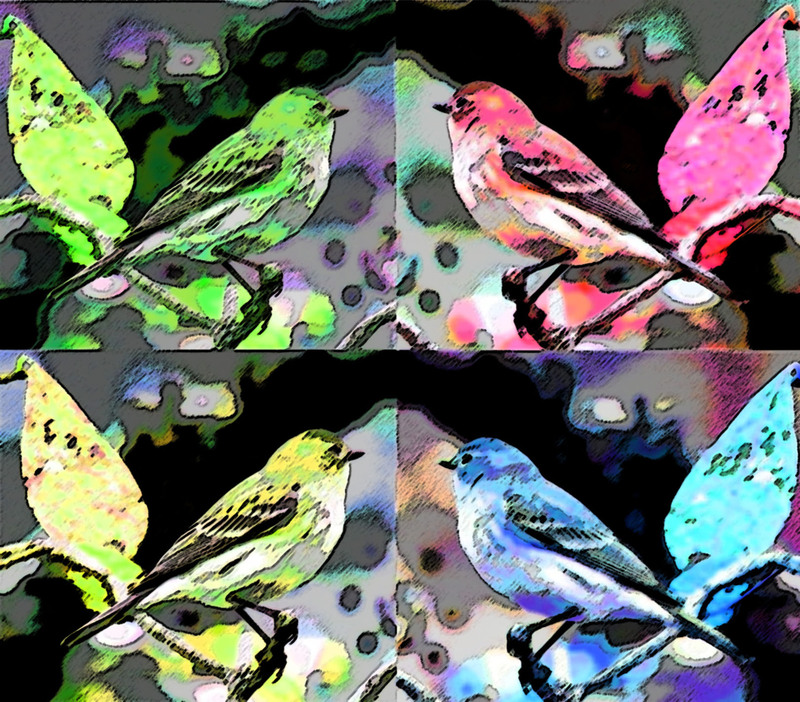 I tinted this bird about ten different colors. I repeated them as Mr Warhol was known to do. 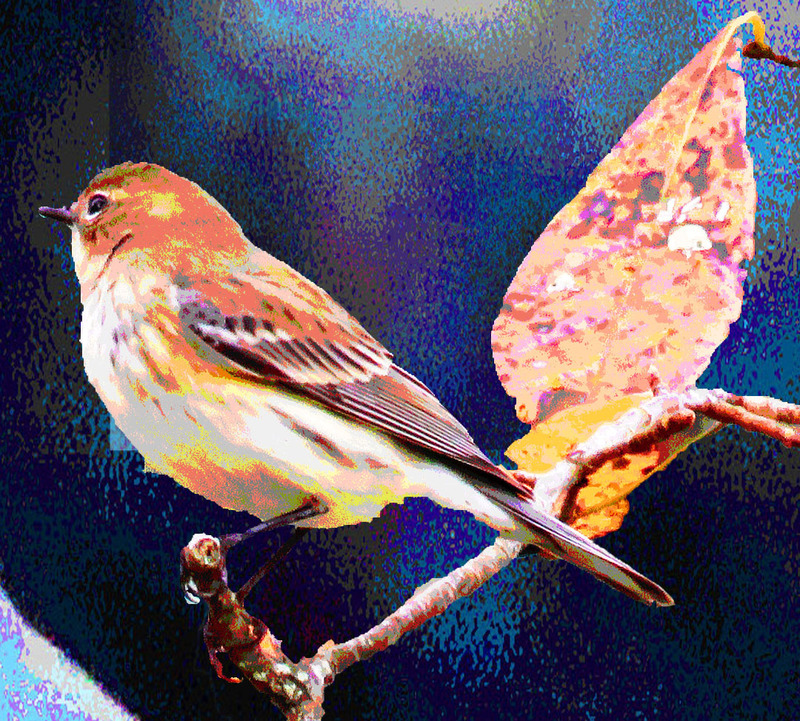 I may never learn the fall warblers, but I did have a lot of fun creating art in a style I have never tried before. 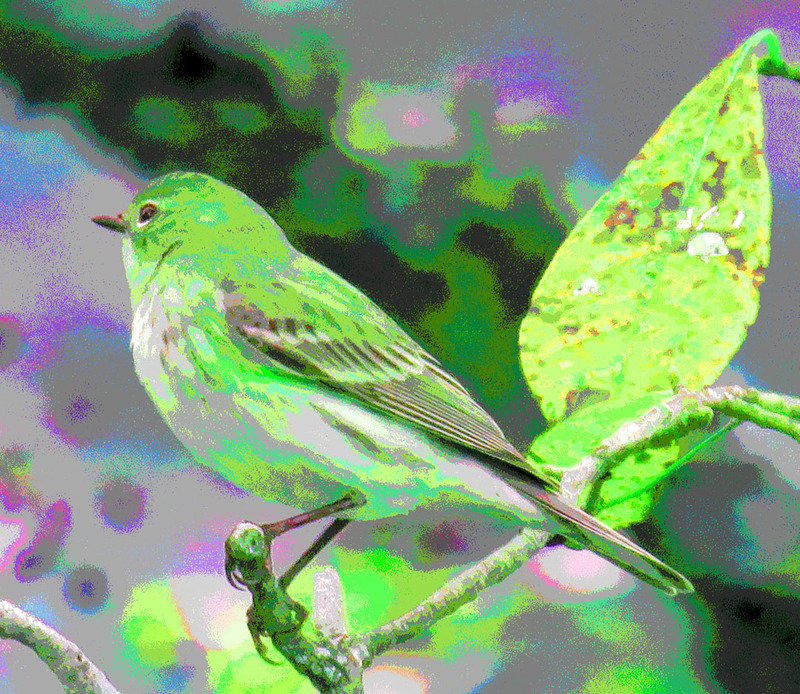 “Birdwatcher Confronted with Nondescript Warblers” – just brilliant! You DO know how to have fun!! And I’m sure the warblers appreciate it.